In the latest Quarterly Industry Report, Finance Magnates takes a closer look at the Southeast Asian industry,. Just a few years ago, brokers that wanted to set up shop in Asia would invariably choose Japan. However, strong competition and market density have led companies to turn their attention to other locations on that continent in the search for better entry conditions. Southeast Asia, which is home to more than 600 million people, benefits from this and is now an important part of the global financial system. This is one of the reasons that increasing numbers of retail brokers are looking for opportunities to open an office in this part of the world, particularly in Thailand, Malaysia, Singapore and Indonesia. In the latest Quarterly Industry Report, Finance Magnates takes a closer look at the Southeast Asian industry, highlighting the main advantages and difficulties of starting up in this rapidly growing market. What is the profile of the average investor? Although only 100,000 people can be identified as active forex and binary options traders in this heavily populated region, the last few years have brought a significant increase in the popularity of the derivatives market – especially in Malaysia, where at least 30,000 out of the 32 million citizens regularly deposit funds in their trading accounts. The average first deposit value (FTD) varies from $250 – $300 and is comparable to results in a few European countries (e.g. Ireland, Poland). Of course, in the case of developed economies, the averages are much higher – in the UK for example the average FTD stands at approximately $600. The relatively low initial deposit values may provide guidance for investment firms regarding the profile of the average trader. Local investors are looking for brokerage accounts with a minimum entry level, and micro-lots, which do not require large funds. The average value of all deposits in the Southeast Asia region is much higher, and oscillating around $1200, double the average payout. At the same time, it should be noted that investors are depositing larger amounts of money in binary options than in the forex market. This is perfectly illustrated by the example of Thailand, where the difference can be as much as three times. 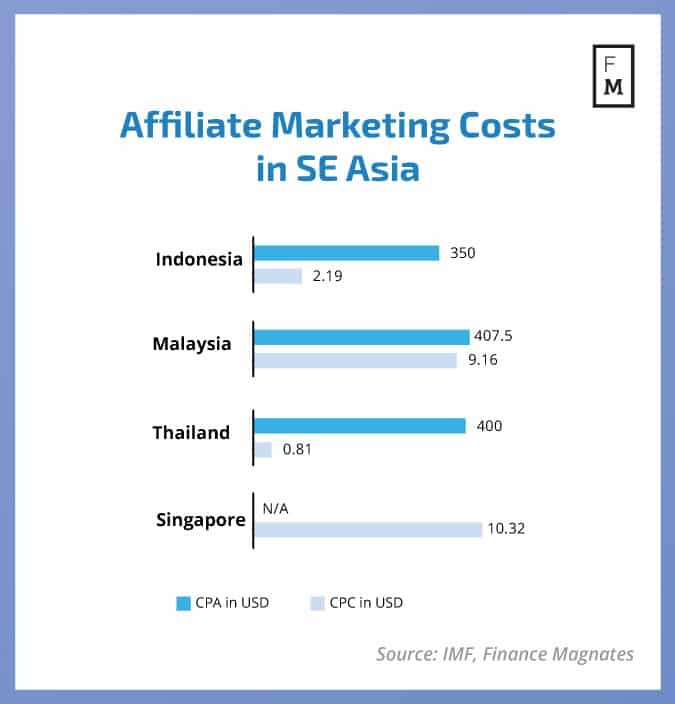 One of the greatest advantages of conducting brokerage activities in Southeast Asia is the relatively low cost of marketing. Cost per click (CPC) is much lower than in Europe, Africa and South America, as well as cost per acquisition (CPA), which amounts to approximately $400. For comparison, in the UK, a broker would pay $140 more for obtaining a customer. There are significant differences in the regulation of local derivatives markets. The highest entry barrier is visible in Malaysia, Indonesia imposes a maximum limit on leverage of 1:200, and in Singapore and Thailand forex brokers are fully permitted. At the same time, it should not be forgotten that brokers operating in Southeast Asia have an opportunity to attract traders from China, who generate substantial trading volumes – twice as high as in the Middle East. Thanks to widespread internet penetration and the relatively low costs of doing business in Thailand, Malaysia, Singapore and Indonesia, these countries could indeed become interesting development destinations for FX/CFD retail brokers.